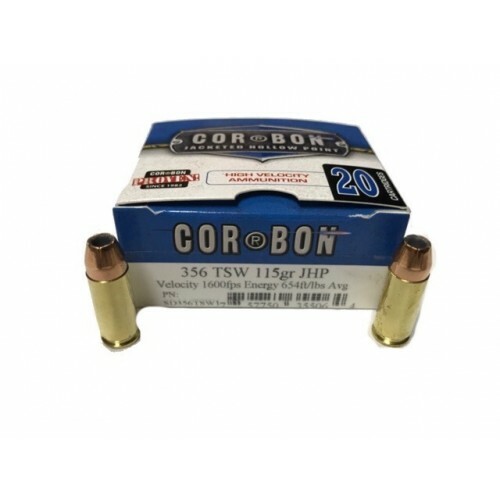 As many of you are already aware, Corbon has re-added the 356TSW cartridge to their product lineup. The initial offering is a 115 grain JHP projectile at an advertised 1600 FPS. That ammunition is currently available for ordering on the Corbon website in full 50 round boxes or the smaller 20 round pony boxes. Now we have all been very skeptical of Ammunition Manufacturers velocity claims through the years. Well our fellow Forum member, s537, has already chronographed some of the pre-production ammunition samples through several of his Personal Smith and Wesson 3566s. 356TSW, thank you so much for the support and the post. I'll include the details here. Peter Pi Jr. had been testing the load for me the month before at their facility in Sturgis, SD, using mostly a 1911 (5") and another one of my 3566 Compacts (3.5"), getting about the same numbers on his end by late June. Once he had the average at about 1600 fps for the 5" barrel and within SAAMI specifications he sent me some of the same ammo to check out in the other pistols. I conducted my tests using my PACT MK IV with new screens on July 9th, 2017, at Ben Avery range here in Phoenix, AZ. It was a sunny 110 degree (F) day. I used all six models of the factory production 356 TSW pistols that I own. Each of these handguns is in really good shape with little if any noticeable wear. The Super 9's 356 barrel was unfired until it was used for this test, and the others did not appear to have any significant wear. It functioned well in all of the factory handguns with oddly mild recoil (subjective of course), flawless cycling, and good accuracy, no case splitting or blown primers, and fair extraction from the 940. I say fair as the casings did not fall out, instead taking a couple heavy handed wacks on the ejector rod to shake lose from their chambers. This is not unexpected from a maximum load of course, which is what this is. The Briley Comp was amazing and convinced me, along with the other pistols, that these S&W models were unequivocally designed and built to shoot the maximum SAAMI specification of this cartridge. I had some lengthy conversations with the Pi's about this cartridge, and some other conversations with a gentleman at another ammunition company about their 115 grain maximum load for 357 SIG, which has comparable muzzle energy, albeit with its inherent capacity and cost disadvantages, and purported manufacturing complications and reloading difficulties. The takeaway from those conversations is that maximum loads for this cartridge (or any other), although within SAAMI specifications must be used carefully and should only be used in firearms originally chambered for them. Ergo, don't re-chamber your Glock or SIG or whatever and expect to run a few boxes of this through it without some problems. The unlock times from this load, with nothing more than a simple re-chamber, are too fast without having the full Browning short recoil system with lugs (1911, Star 30/31, etc. ), or a muzzle brake to slow the initial impulse a bit. You must not compare this 115 grain loading to the previously available loading's. The early nineteen-nineties 135 grain and 147 grain from Federal and the 124 grain from Corbon are not maximum pressure, and as such you can shoot them through some re-chambered pistols, if sprung correctly. I have done it with a re-chambered SIG P220, Ruger P89, Glock 17, Glock 19, and Keltec P11. Others have done the same and more. Mine all functioned fine with old 356 TSW factory loading's as the pressure from them is not too much over 9mm+P, and adding stiffer recoil springs took care of business pretty well. What does it all mean some may ask? Not much. It is just a verification that affordable 9mm capacity with 357 Magnum power in a small or medium sized auto-loader is possible, and has been for over 25 years. Many have already known this for quite awhile. Some on the S&W Forum have done extensive testing (bad_man_ one) long before this version of the cartridge came along. It is here now though, within SAAMI specification, and all speculation put to rest. Perhaps it will now grow into what it could have been. Thank you for the info; I saw CorBon has brought this out, but wasn’t aware of the rest of your post.